The new Halloween movie strips away decades worth of horror canon from every film in the franchise past the first one, but you only need to watch a few minutes to see it still has plenty of reverence for what came before. Michael Myers' latest return is jam-packed with Halloween Easter eggs and references to the original, with everything from extremely familiar shots, to sneaky cameos from original actors. With that in mind, we put together this list of the biggest and best nods Halloween 2018 has for Halloween 1978. Spoiler warning: We'll talk about everything from the beginning to the end of both films, so if you haven’t seen them yet, you may want to bookmark this article and come back after you’ve watched the best Halloween movies. The original Halloween's opening credits are iconic: a slow zoom into the carved face of a lit jack-o'-lantern as director/composer John Carpenter's theme music plays. Halloween 2018 doesn't recreate that opening, but it does pay direct homage to it. We see a rotten pumpkin decomposing in reverse, revealing the exact same carving (right down to the notch between the mouth and nose) as in the original film. And a very similar version of the theme plays, though again it isn't identical, with stronger reverb and a weaker electronic ticking sound. Dr. Loomis (played by Donald Pleasance, who you may also know as James Bond's nemesis Ernst Stavro Blofeld) is an older man in the original Halloween, and his character is deceased when the new film begins. However, we quickly learn that Michael's new doctor, Ranbir Sartain, was a student of Loomis'. Sadly it seems that Sartain didn't pay enough attention in class. While Loomis was convinced that Michael was pure evil and should never be allowed back into society, Sartain actually wants to see The Shape in action and study him in the midst of a murder spree. 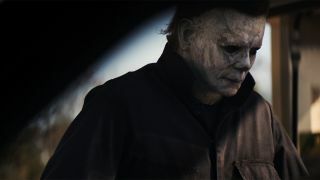 It's one of many satisfying ways the new Halloween steers well clear of "glorified remake" status by subverting our expectations from the original. 3. "It was the boogeyman"
The true crime podcasters we follow through the first act of Halloween 2018 ask Laurie if she still believes in the boogeyman. They're not being patronizing (at least not any more than usual), they're referring back to a few lines from the first movie. When the little boy Laurie's babysitting first sees Michael lurking across the street, he calls him the boogeyman - though he's naturally gone by the time Laurie looks through the window. After Dr. Loomis saves Laurie from being choked to death by Michael, she shakily says that "it was the boogeyman". Looks like the name stuck. A group of teens walking to school on Halloween in Haddonfield, Illinois couldn't stop talking about the babysitter killer, especially when one of them is the granddaughter of his last would-be victim. Allyson Nelson isn't so eager to engage in the loose talk about Michael Myers, given how much she's probably already heard about him from her grandmother, but she does lay down the new canonical truth on on one thing: Michael Myers and Laurie Strode are not siblings. The plot twist that surfaced in Halloween 2 and more or less informed the many Halloween movies that followed (up until now) is slashed down and retconned faster than you can say, "Darth Vader didn't really murder Anakin Skywalker". There's something very familiar about the scene when we rejoin Allyson in the middle of class. She's has a similar seat as her grandmother did decades ago when Laurie first saw Michael, spotting him as he watched her from across the street (note that Laurie had no reason to think he was anything worse than a weirdo in a costume at the time). Allyson looks out the window and sees, staring directly at her, Laurie. This inversion of stalker and protector roles is another one of the ways Halloween 2018 plays with your preconceptions. Sticking with the same high school scene, the teacher at the head of Allyson's classroom is no newcomer to the Halloween franchise. She's played by P.J. Soles, the same actress who portrayed Laurie's friend Lynda in the original Halloween! I don't think it means Lynda secretly survived being strangled with a curly phone cord - she looks pretty dead the last time we see her - but it's just meant as a wink to the original, not to mention Soles' broader career as a horror star. Ready for a deep cut, and not the kind you make with an oversized kitchen knife? Ok, so the song the unfortunate father and son are listening to on the radio in their truck was created for the movie... but you still may have heard some of it before. How? It's a fully composed and produced version of the fake song Laurie absentmindedly sings a few bars of in the original Halloween: "But I wish I had you all alone, just the two of us, so close to you." So the budget on Halloween 1978 being too low to license a song for Laurie to sing inspired the creation of a real song 40 years later. Movies truly are magical sometimes. Thanks to Digital Spy for the scoop on this one. Michael has a certain way of making an escape that really works for him: waiting for a dark and dreary night where he can sneak away under cover of both darkness and a bunch of other people dressed just like him. Hollywood's continued use of people with mental illnesses as shorthand for "scary stuff" rankles just as much now as it did in the original, but there's still something undeniably creepy about pulling up to a road full of wavering silhouettes in matching white scrubs whether it takes place in 1978 or 2018. Michael gets back in his slasher stride as soon as he hits the streets of Haddonfield, and the segment of him terrorizing the town on Halloween night is where the film most closely mirrors the original. Just like in 1978, a little kid bumps into Michael and (after a few tense moments wondering whether that kid is about to get slaughtered) runs off to find his friends. We follow just behind Michael in a lengthy shot as he looks for a few things to complete his killer kit (and tests them out on some hapless victims). Later, he even kills a babysitter and her boyfriend - who are, again, friends of the protagonist - in familiar ways, featuring once more both a sheet with eye holes cut out and a poor twerp pinned to the wall with a kitchen knife. When Laurie finally finds Michael (or maybe the other way around) hiding in her fortified home, they scuffle for a bit before Michael throws her off a second-story balcony. He probably would have followed her down to finish her off, but then he hears Allyson calling out for help from downstairs - and he almost gives the camera a "doesn't that just figure" look from behind the expressionless mask. MIchael hesitates a moment too long, and when he looks over the railing a familiar synthesizer sting plays as we see Laurie's "body" is gone. This is an inversion of the very end of the original Halloween, when Michael falls over a railing after being shot several times by Dr. Loomis. A few beats pass and the camera follows him over, showing that nothing's there. Laurie clearly learned a few tricks from her nemesis. Find plenty more screams in our list of the 25 best horror movies of all time.